National Emblem of the Republic of Kazakhstan is a picture of a shanyrak ( the cupola of a yurta) on a blue background, from which uyks (body bracket) like sun rays are being radiated in framing of wings of mythical horses. At the bottom of the emblem there is an inscription “Kazakhstan”. In colour picture the National Emblem of the Republic of Kazakhstan are of two colours: golden and blue-and-sky-blue. National Emblem of the Republic of Kazakhstan is an image of shanyrak (upper dome-like portion of a yurta) against a sky-blue background which irradiates (in the form of sun rays) uyks (supports) set off by wings of mythical horses. 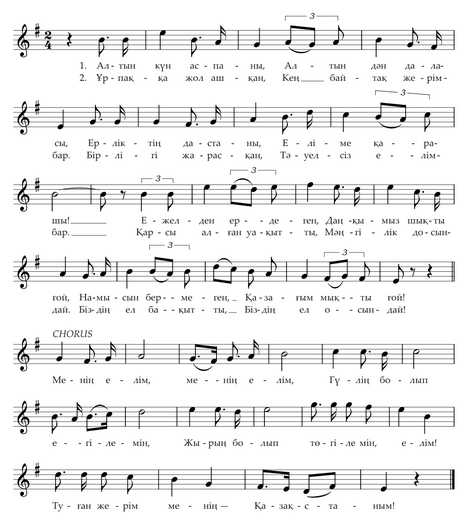 The lower portion of the Emblem bears an inscription “Êàçàêñòàí”. 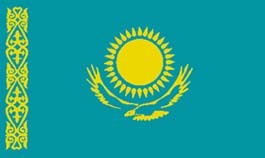 Colour version of the National Emblem of the Republic of Kazakhstan consists of two colours: golden and blue/sky-blue. 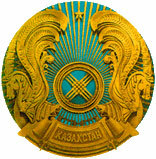 Reproduced image of the National Emblem of the Republic of Kazakhstan, whatever the size, must exactly conform with the colour (resp. black-and-white) design of the reference standard of the National Emblem of the Republic of Kazakhstan kept at the Residence of the President of the Republic of Kazakhstan.